LIGHTWEIGHT AND COMPACT: Exterior dimensions: 9.5 x 5.5 x 6.5 inches. Interior Dimensions: 7.5 x 4.5 x 5.5 inches. Holds and protects 1 camera, 1-2 lenses or small accessory. ADJUSTABLE COMPARTMENTS: Velcro fastened padded insert separates your camera and lens, or small accessory into separate compartments. MULTIPLE CARRYING OPTIONS: Padded carry handle and removable, adjustable shoulder strap offer multiple ways to carry. MULTIPLE ACCESSORY POCKETS: Organize extra batteries, memory cards, cables, lens caps, or other small accessories. SATISFACTION GUARANTEED: Backed with Digital Goja 90-Day 100% Satisfaction Guarantee. Do you prefer to keep it simple and travel light? Then, this bag is for you. The Camera Bag Shoulder Case by Altura Photo is a lightweight, portable, compact camera bag for travel with easy access for on-the-go photography. This versatile case securely stores your DSLR, mirrorless, or hybrid superzoom camera with the essentials. This case is the ideal, compact solution for carrying your digital camera and a few essentials..
- Made from durable polyester material, outfitted with reinforced padded carry handle. 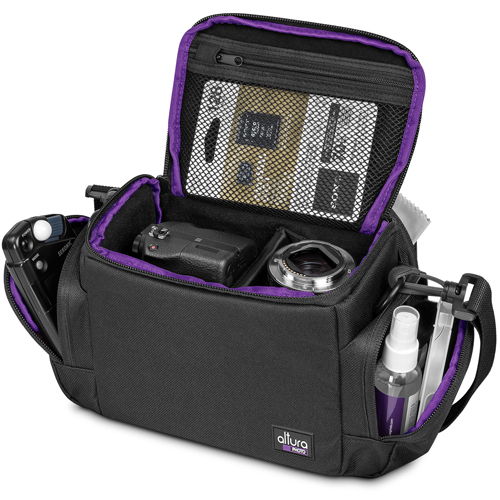 - Velcro fastened padded insert separates your camera and lens, or small accessory into separate compartments. - Lid opens away from your body for fast, easy, and secure access to your gear. - Easily accessible front zippered pocket for accessories. - Two zippered side pockets for small essentials. - Removable shoulder strap adjusts to accommodate a variety of heights and carrying preferences. - Reinforced stitching used at stress points. We are official US Authorized Dealers for Canon, Sigma, Olympus, Sony, Manfrotto and other leading photography brands, as well as exclusive sellers of Altura Photo® and the MagicFiber Microfiber® - We are the original bundle experts and your source for all your photography needs. If you have any questions or comments, please do not hesitate to contact us directly. We'll get back to you right away. Customer satisfaction is our #1 priority. Our goal is to offer the lowest price possible, and in most cases, we offer MAP (minimum advertised price) pricing. This means you can't get a lower price than us and in addition, we include extra accessories with our custom GOJA bundles. Never. Everything sold by Digital Goja is brand-new and in its original packaging. Do your Canon and Sigma Bundles have a warranty? Yes! As Canon and Sigma USA Authorized Dealers, our products have full US warranty just like buying in any big chain store. Only our bundles offer a much better value. Shop with confidence. If I purchase today, when will my package be shipped? What shipping carrier do you use to send your packages? We send most of our packages through United States Postal Service (USPS). Orders over a pound in weight ship Priority Mail. Our distribution facility is located in Miami, Florida, USA. I'm having trouble figuring out how to use my product. Can you help? Absolutely! We are proud to share with you hundreds of instructional and how-to videos that we've created answering all your questions. Check us out on YouTube by searching "Digital Goja" or send us an email and we'll be glad to help you. All of our products ship with Free Standard Shipping to US locations. Expedited and International shipping may have additional costs. Please see the product page for the exact shipping cost per item. You can also verify the exact costs during checkout. All packages are shipped the next business day. International buyers can expect parcel arrival within 15 business days; however, delays of up to 30 days have been known to occur depending on the country's postal service. International Buyers - Please Note: Import duties and taxes are not included in the item price or shipping cost unless the Item is send with the eBay Global Shipping Program. These charges subject to your country's laws and customs and are the sole responsibility of the buyer to investigate such costs. We accept PayPal as payment method for any domestic transaction. Packages destined to Florida are charged an additional 7% in sales tax according to state law. International payments must be submitted through PayPal to guarantee safety of the transaction. We are committed to your 100% Satisfaction and will do whatever we can to meet that commitment. Hopefully, our feedback is a testament to that effect. If you are not satisfied with your purchase or you have any question about your product at all, please contact via the "Ask a question" button below. You may return products in their original, undamaged packaging within 60 days of your order, for a refund, or a replacement. You must contact our customer service department to receive a Returned Merchandise Authorization (RMA) number, to ensure proper handling of the return and/or replacement. Products cannot be returned without an RMA number. Shipping expenses, if any, will not be refunded. Returns should be packed in an outer shipping carton, to avoid defacing the original box/packing of the product. The RMA number should be clearly written on the shipping label or somewhere on the package. Returned merchandise that gets lost or damaged in transit is not the responsibility of Digital Goja. If the return is due to our error, we will pay for the return shipping costs and this will be communicated at the time of the issuance of the RMA number. Return requests more than 30 days past the order date cannot be returned. If the following conditions are not met, Digital Goja reserves the right to refuse the return or to charge a restocking fee of NO LESS THAN 20%. All returned or exchanged items must be in brand new condition, in their original box, and must include all packing material, blank warranty cards, manuals, and all accessories. Merchandise missing the original Universal Product Code (UPC) cannot be returned. Items with timers must show less than 30 minutes of use. Items with shutter counters must show less than 50 exposures. Digital Goja is not responsible for personal data or items left in returned merchandise. Digital Goja is not responsible for any consequential or incidental damage resulting from the sale or use of any merchandise bought from us. We are only responsible for the monetary value of the merchandise. We strive to respond to all emails the same business day, and in most cases within 4 hours. Please note that on Mondays or days after holidays, response to emails may take longer. Thank you in advance for your patience. Please remember that we will do whatever we can to make you a happy customer.